It’s amazing that whenever you try to lend a helping hand, people come on your path who are in need. April’s cause was of course, Japan, because so many people lost their homes, their loved ones and are now struggling to rebuild. We got in touch with a Canadian guest who went to Salsa & Salsa in Cozumel. She gave English classes at a school in Sendai for a while. The owner of the school is Michiko Eckard. She married an American, and moved to Seattle so her 3 kids could get an American education, but she arrived to Japan shortly before the earth quake struck. Since then she has helped many people in the Sendai community, including an elderly home and many internally displaced people. There is a lot of damage to the building, but the government inspectors did NOT give it a ‘red-tag’ (which means no one can occupy that building)! Little LELA managed to collect the astonishing amount of $1,150USD, combining donations from Mazatlan, Cozumel and Los Cabos. A hundred percent of our donations will be going to this school in Sendai where it will buy school books, and help rebuild parts of the school that were demolished by the quake. May’s cause for LELA will be the town of Tuscaloosa, Alabama. It was almost completely destroyed by the tornado that struck at the end of April. The money will go to the DCH Medical Centre in Tuscaloosa. 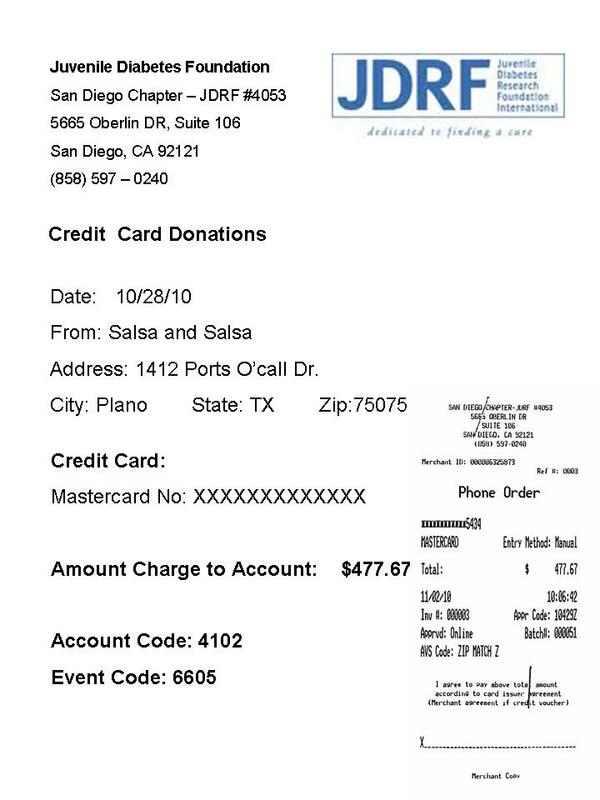 As soon as we have more details, they will be posted on our website (www.salsaandsalsa.com/lela.php). Who doesn’t like a nice hot cup of coffee? Especially in these cold winter months it’s a good way to wake up in the morning: ANY TIME is a good time for coffee!!! 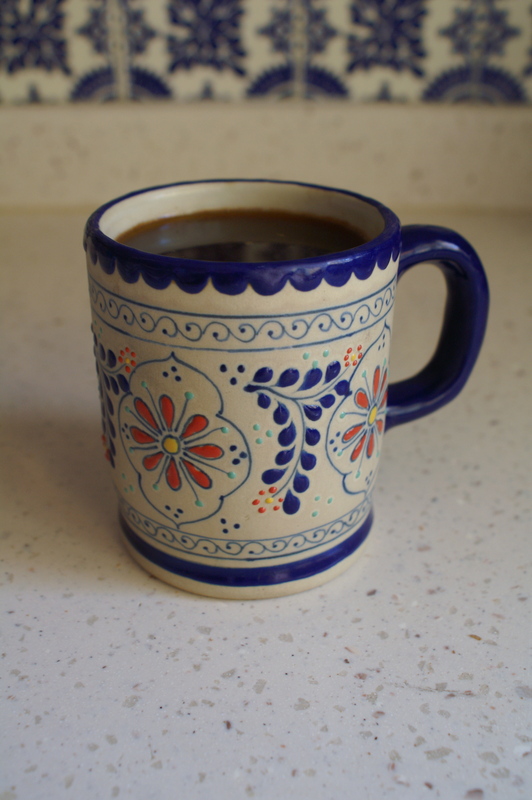 I was thinking of that during the Christmas Holidays how it would be nice to share another recipe with you: Mexican Coffee. My mother-in-law prepared this for me when I came to Mexico for the first time in 2001 and I immediately loved it! 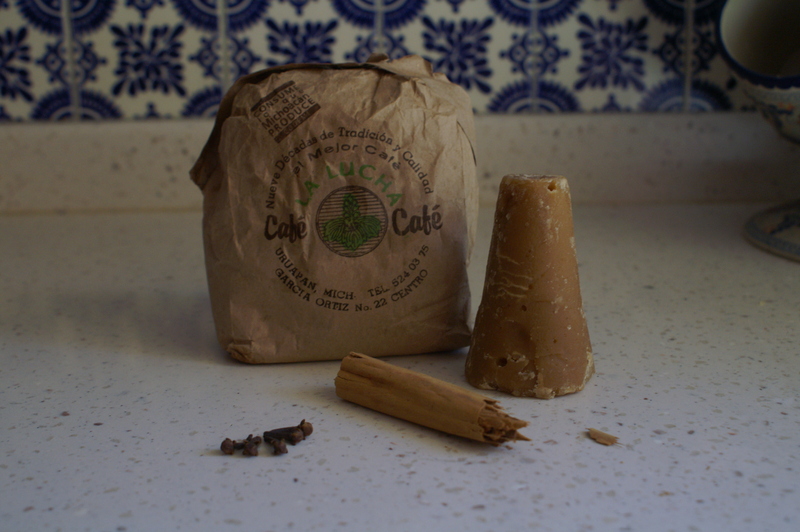 This coffee is prepared in a special clay pot, hence the name ‘Café de Olla’ or Coffee from the Pot. The recipe calls for ‘piloncillo‘, which is a block of raw cane sugar, but you could use mascabado sugar instead. Enjoy!!! Heat the water in a saucepan and add the cinnamon and cloves. If you want, you can add the orange peel. Once it boils, add the piloncillo or mascabado sugar and leave it to dissolve. Lower the heat and add the coffee. Leave everything to boil for 5 minutes. Switch off the heat and let it stand for another 5 minutes. Sieve before serving. October has brought us Snowbird season and more cruise ships coming into port. Our Local Show on Monday has started of with ever increasing numbers. 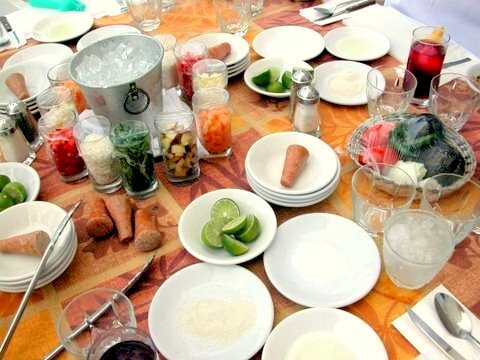 We enjoy showing all our guests the interesting smells and flavors that Mexico has to offer. So if you’re in town, come and join us! Reservations are a must! Just go to our website for more information. The cause for LELA in October was the Juvenile Diabetes Research Foundation. We had almost the double amount of shows comparing to September, so we were very happy to collect a total sum of $477 dollars! In November we will be collecting for the Lupus Research Institute. 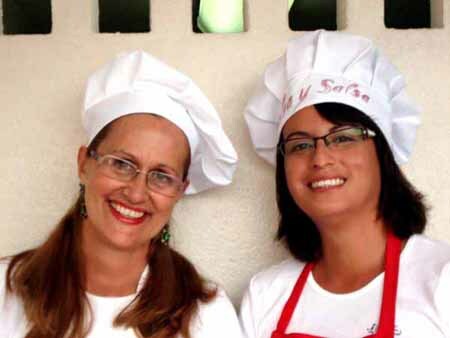 This cause is very dear to our heart, because Dancing Chef Stephanie’s sister suffers from Lupus. Lupus is a chronic and often disabling autoimmune disease. Estimates indicate that more than 1.5 million Americans have lupus. The Lupus Research Institute (LRI) is the only nonprofit organisation in the US that’s dedicated to research in lupus. It was founded in 2000 by people with this devastating illness and their families in collaboration with the country’s leading scientists. LRI sends nearly 94 cents of every dollar contributed straight to the scientists in their laboratories searching for answers to lupus. During each month we always come in contact with people who have a special interest in the cause for LELA. It’s very rewarding to see impact LELA has. The more money we raise, the closer we get to finding a cure for Lupus. We did it! On Thursday we opened up our donating pig, Lela. Our Monthly ritual of opening little Lela has become an exciting part of our routine. Leonique and I play a guessing game, as to how much Lela has collected for the month. As you know, Lela was collecting for your Danny Did Foundation. Your uncle and Executive Director of the Foundation, Tom Stanton, has been a great help, thanks to him, we were able to make this happen. He sent us an article regarding SUDEP and Epilepsy, which I’m sure you would find interesting. The NY Times published an article regarding the death of a young teenage boy (he was 19…) due to SUDEP. Just like yourself, he was taken at a young age. The article raises several alarming issues regarding the stigma of SUDEP, how it is considered controversial for a doctor to mention it to his patient unless the patient is a high-risk candidate, as it may ‘burden‘ the patient. Maybe if it was mandatory for doctor’s to mention it and make families aware of the issue, we might find less occurrences. The article is a good read and very informative and we have posted it below. Also, the resources page on the Danny Did website is a great source of information for those who need answers to their questions regarding Epilepsy. We are doing what we can in raising awareness through social media and through our donations page and we hope that past guests and future guests will continue spreading the word. We hope the little we donate this month will help someone, somewhere and give them a little more hope than they had yesterday 🙂 Your smile gave us courage to speak up and tell people that something needs to be done. Daniel George Stanton (2005-2009) and still making a difference. We are so so happy to say we collected $305USD for the Danny Did Foundation. These donations were made by cruise passengers from the Mariner of the Seas and Carnival Splendor. We had a total of 8 ships this month, so considering the majority of the donations are $1’s or the occasional $5, that’s an amazing accomplishment. We had so many passengers come up to us and shake our hands, telling us they had a brother, or sister, or friend with Epilepsy and that raising awareness was so so important. So thank you Danny…thank you for giving us the opportunity to touch so many people’s lives, thank you for being there and thank you for having found your way into our hearts. Danny, we hope that wherever you are, you are smiling, laughing, playing and seeing what an effect your life has made on so many lives. You can see the happiness here, a collection of pictures of everyone who donated to Lela the donating Pig for the month of July. So from the table of laughter, we bring you their Salsa Creation. At first, when we were called over to try it, we were hesitant. I personally thought the worst (hahaha) and I tried to get out of trying it by saying “Oh, I had a huge breakfast…” but that was to no avail. I was given a Totopo (corn chip) and my hand was motioned to dip and eat. So I dipped…and I ate! MMMMMMMMMMM! Truly. It was delicious, so I looked at Leonique and said “You gotta try this”, which she did, and she had the same reaction “Mmmmmmmmm”. Unfortunately, at the time, we didn’t think to take a picture, but we promise to make and post this delicious creation within the next few days. 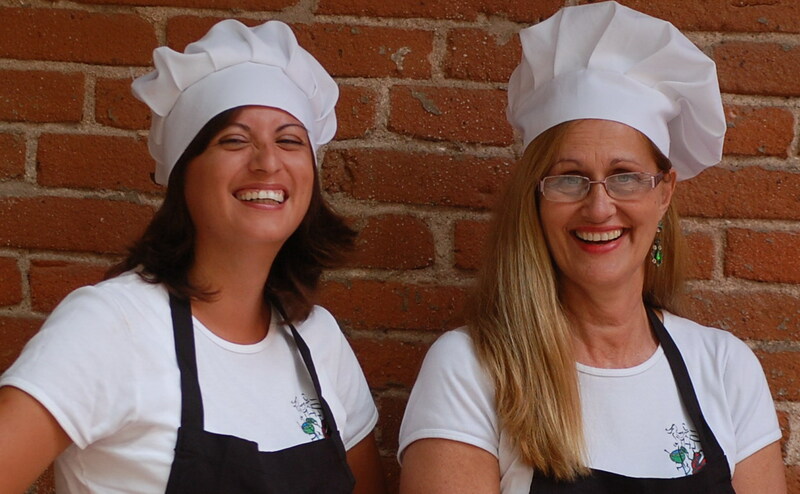 Enjoy salsa chefs!